The Gay Gamer: I can't quite put my finger on it, Link, but there's something different about you these days! I can't quite put my finger on it, Link, but there's something different about you these days! Anyway, I can't say I'd like to play a version of The Legend of Zelda that features such a sinewy Link, but I don't have any qualms with looking at fan art that depicts the Hyrulian legend in such a fashion. To see more of Chilean artist Gonzalo Ordóñez Arias' work, check out his deviantART gallery at your earliest convenience. Yikes. 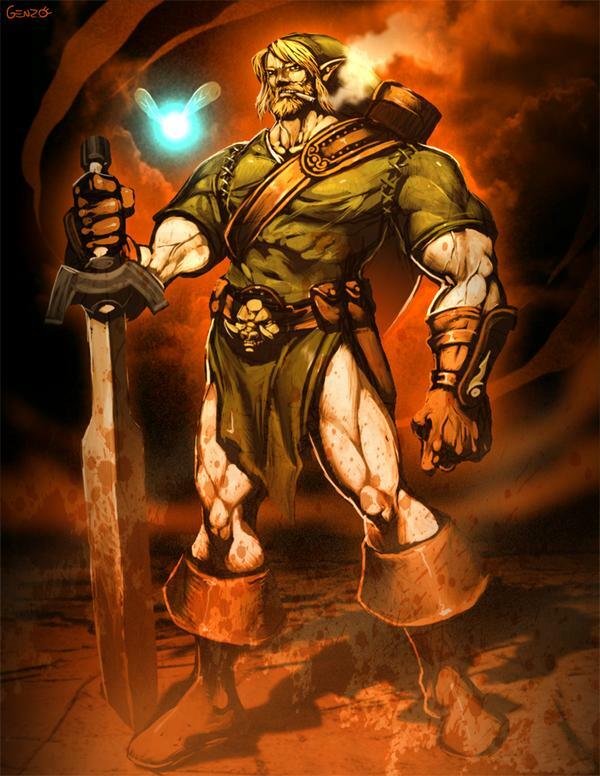 He looks like he could take Ganondorf's head off with a swipe of his big bear paw. Yeah...it would defeat the "little man on a big journey" feeling, I think. I agree. Like I said in the original post, I wouldn't really want to play a game starring He-Link anyway. He's fine for fan art, but that's about it.